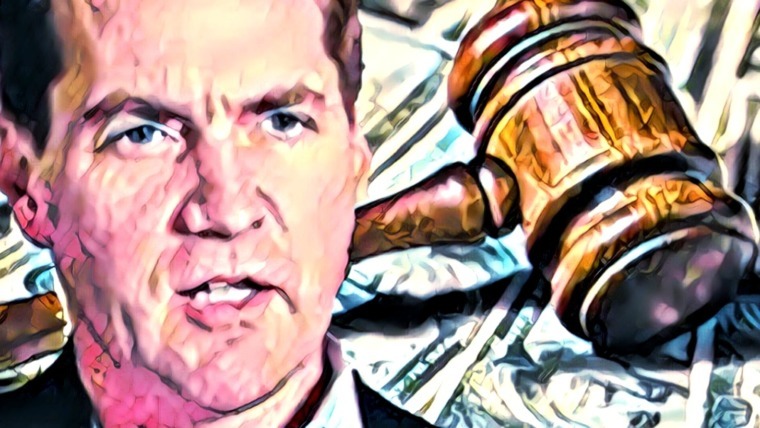 Aeternity has been rallying since mid-September to reach a high at $1.50. The market has pulled back slightly and is now trading at .382 Fibonacci Retracement support. Support levels moving forward: $1.23, $1.14, $1.06, $1.00, $0.93, $0.84. Resistance levels moving forward: $1.40, $1.50, $1.69, $1.79, $1.93, $1.96, $2.00. Aeternity is ranked 30th in terms of overall market cap rankings with a total market cap value of around $299 million. 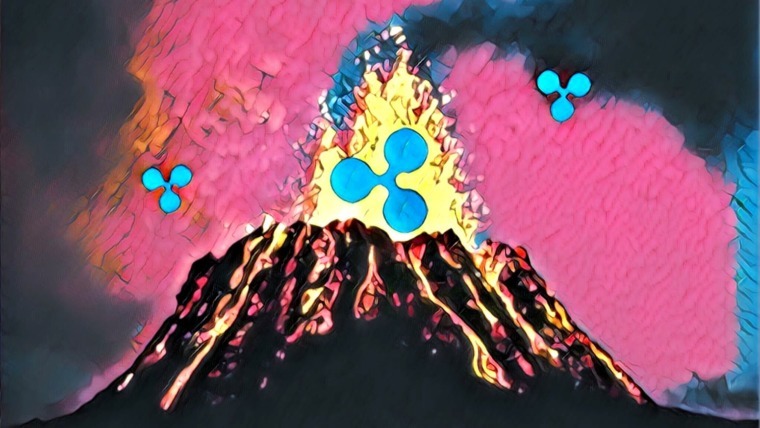 The cryptocurrency has seen a turbulent 90-day trading period where price action dropped by a precipitous 35%. The 17-month old coin is now trading at a value that is 74% lower than its all-time high price. 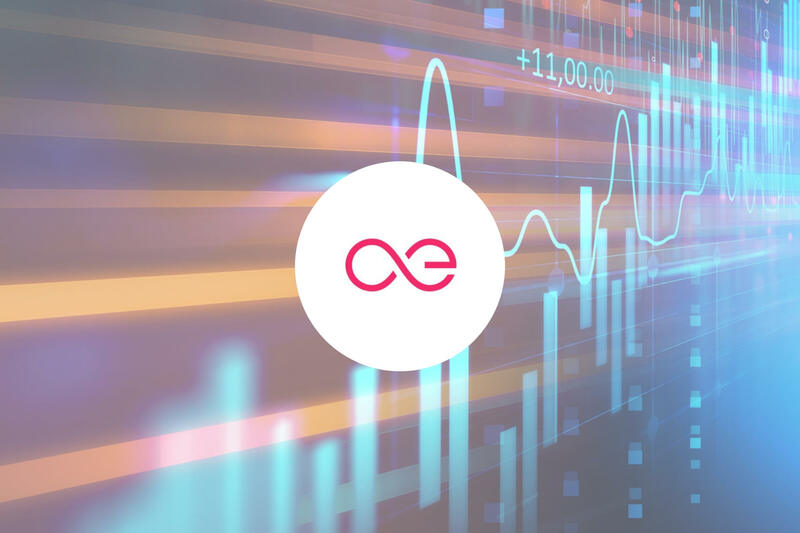 Let us continue to analyze price action for Aeternity over the short and long term and assess the market behavior. Looking at the market from the long-term perspective above, we notice that since May 2018 price action has depreciated over subsequent months. 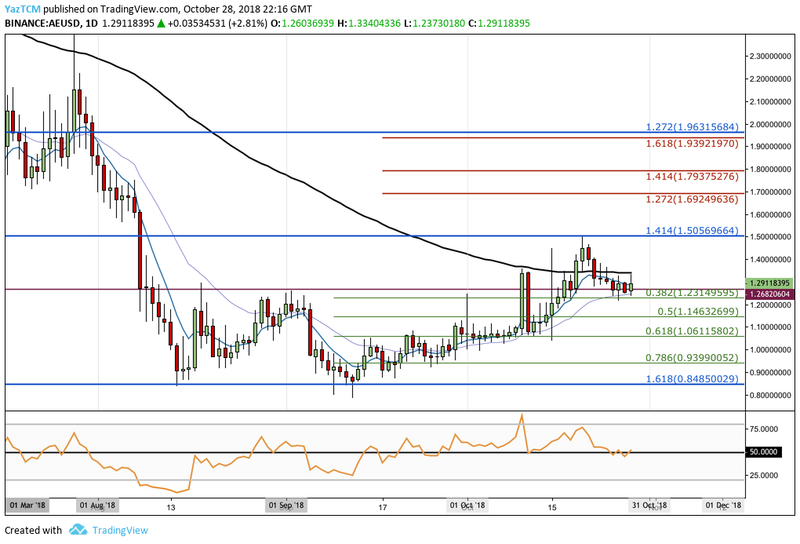 The AE/USD market continued to decline, until finding a form of relative strong support provided by a downside 1.618 Fibonacci Extension level priced at $0.8485 during August 2018. 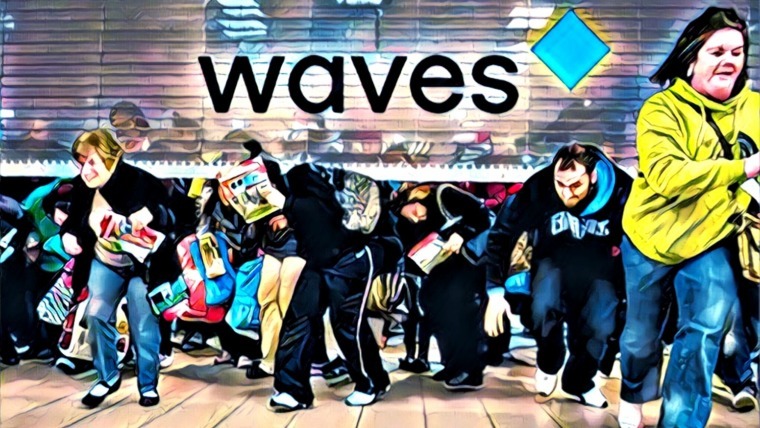 We can see that this level of support was tested once again during September 2018 but successfully managed to support the market from dropping lower. Price action then went on to rally until meeting support at the 1.414 Fibonacci Extension level priced at $1.5056. The market is now trading at support provided by the April 2018 lows priced around $1.2682. Let us continue to analyze price action a little closer over the short term and highlight any areas of potential support and resistance. Evaluating the market with the benefit of a closer perspective, we can see that after it rebounded from the support at the long-term downside 1.618 Fibonacci Extension level (drawn in blue), the market began to rally. 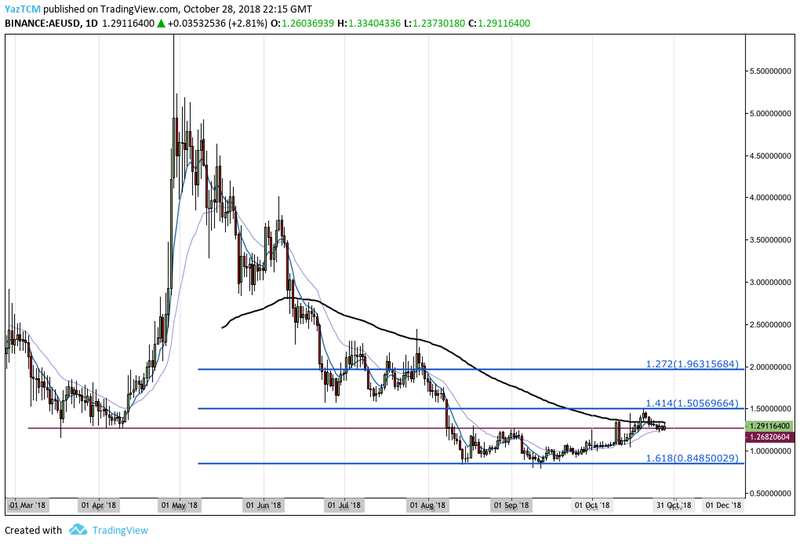 AE/USD began at a low of $0.7852 on September 12, 2018 and extended to a high of $1.5040 on October 20, 2018. This was a price increase totaling 90% from low to high. The market has since rolled over and retraced slightly, and is now trading at support provided by the short-term .382 Fibonacci Retracement level (drawn in green) priced at $1.2314. If the bearish momentum re-enters the market and pushes price action below the support at $1.23, we can expect further support below to be located at the .5 and .618 Fibonacci Retracement levels (drawn in green), priced at $1.14 and $1.06 respectively. If the bears continue to push AE/USD below the support at the psychological round number handle at $1.00, more support can then be located at the .786 Fibonacci Retracement level (drawn in green) priced at $0.9399, followed by the long-term downside 1.618 Fibonacci Extension level (drawn in blue) priced at $0.8485. On the other hand, if the bulls continue with their recently established presence and push prices higher above the 100-day moving average, they will encounter immediate resistance above at the long-term downside 1.414 Fibonacci Extension level (drawn in blue) priced at $1.5056. If the bulls continue higher, then even more resistance can be expected at the short-term 1.272 and 1.414 Fibonacci Extension levels (drawn in red) priced at $1.6924 and $1.7937. The final level of significant resistance to highlight is the long-term downside 1.272 FIbonacci Extension level (drawn in blue) priced at $1.9631. Let us continue to analyze price action for Aeternity relative to Bitcoin over the long term. Analyzing price action for AE/BTC, we can see the similar downtrend occurring after the end of the price surge during May 2018. 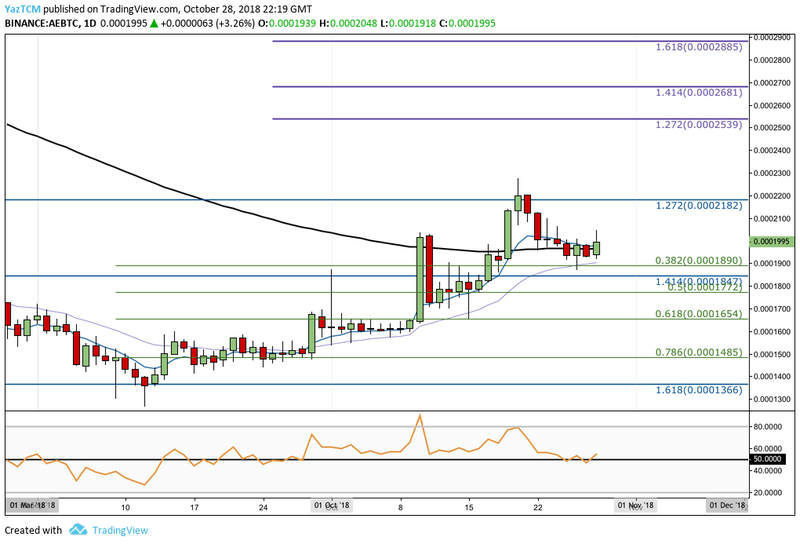 Price action has continued to decline until it had found support at a downside 1.618 Fibonacci Extension level priced at 1,366 SATS during September 2018. As price action reached this area of support, the bulls started to defend the level aggressively, causing the previous downtrend to reverse. We can see that the market then continued to rally until meeting resistance at the downside 1.272 Fibonacci Extension level priced at 2,182 SATS. Let us continue to analyze price action a little closer and highlight any potential support and resistance areas moving forward. Looking at the market from a closer perspective, we can see that after reversing the downtrend, the market went on to rally by over 78%. 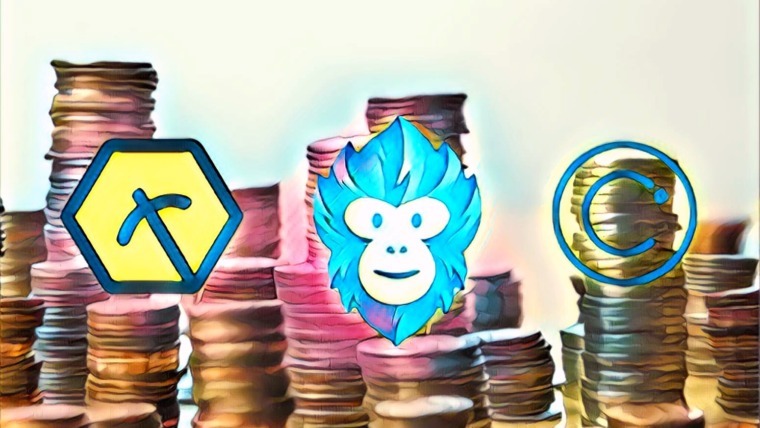 It started from a low at 1,266 SATS on September 12, 2018 and extended to a high of 2,275 SATS on October 20, 2018. We can see that price action here has also pulled back slightly until finding support at the short-term .382 Fibonacci Retracement level priced at 1,890 SATS. Moving forward, if the bulls continue to pressure the market higher, they will meet immediate resistance above at the previous 1.272 Fibonacci Extension level priced at 2,182 SATS. If the bulls can continue higher beyond this resistance, more higher resistance will be located at the short-term 1.272 and 1.414 Fibonacci Extension levels (drawn in purple), priced at 2,539 SATS and 2,681 SATS respectively. The final area of short-term resistance to highlight is the 1.618 Fibonacci Extension level (drawn in purple) priced at 2,885 SATS. Alternatively, if the bears continue to pressure the market lower, they will experience initial support below at the .6 Fibonacci Retracement level (drawn in green) priced at 1,772 SATS. 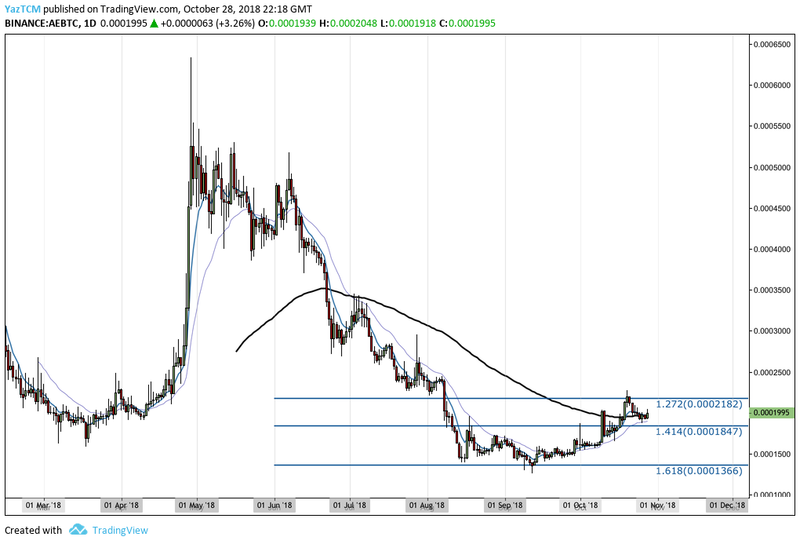 Further support below this can then be located at the .618 and .786 Fibonacci Retracement levels (drawn in green), priced at 1,654 SATS and 1,485 SATS respectively. The RSI technical indicator is producing a reading that slightly favors the bulls within the market as the indicator pokes above the 50 handle. If the RSI remains above 50, we can expect the market to continue to make gains.